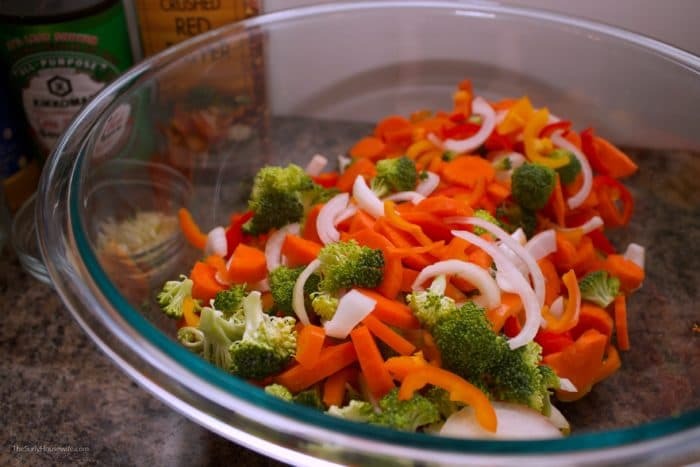 Veggie stir fry is a cheap and easy meal which leaves your family satisfied! We all have those bits and pieces of vegetables in our fridge that we just don’t seem to get around to eating. Veggie stir fry to the rescue!! You reduce food waste, get in a health serving of vegetables, and it tastes fantastic. A family friend used to make us the BEST chicken stir fry back in the day. It was simple, delicious, and comforting. Before we moved to Wisconsin, I made sure she gave me the recipe. I have tweaked it a little bit since then but it is one of my go-to recipes. 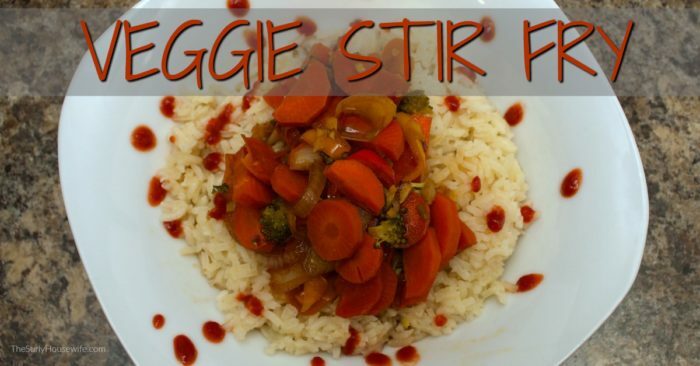 My veggie stir fry recipe is for a simple supper. If I am craving more protein, I top it with a fried egg. However, if you need the protein you can simply add your favorite cut of meat. I serve it with butter rice and pot stickers to make it a complete meal. But it makes a fantastic lunch and reheats well for leftover night. 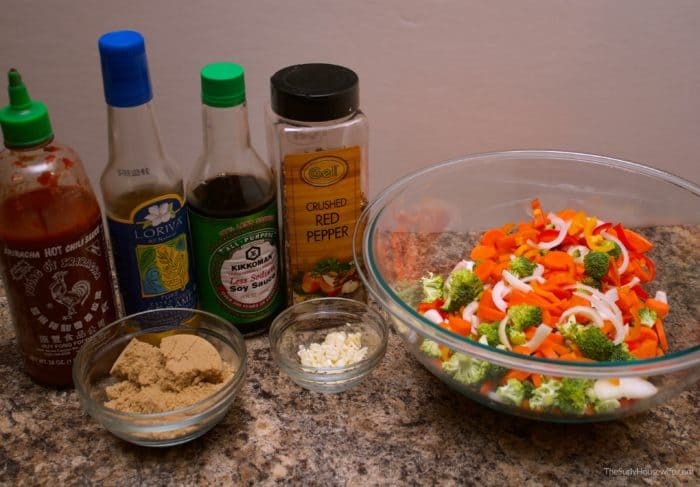 Making veggie stir fry is so easy. First you chop up vegetables. Then you whisk together the sauce. And finally, you cook! The cook time depends on your preference on how well done you like your vegetables. I like my carrots pretty soft so I cook the stir fry for up to 30 minutes, but it can cook in half that time. 3. Add vegetables and season with salt and pepper. Soften for 2-3 minutes. 4. Whisk together the brown sugar, soy sauce, Sriracha, garlic, ginger, and red pepper flakes. 6. Reduce heat to simmer and cook till desired doneness. 7. Serve on top of rice, add Sriracha, and enjoy! 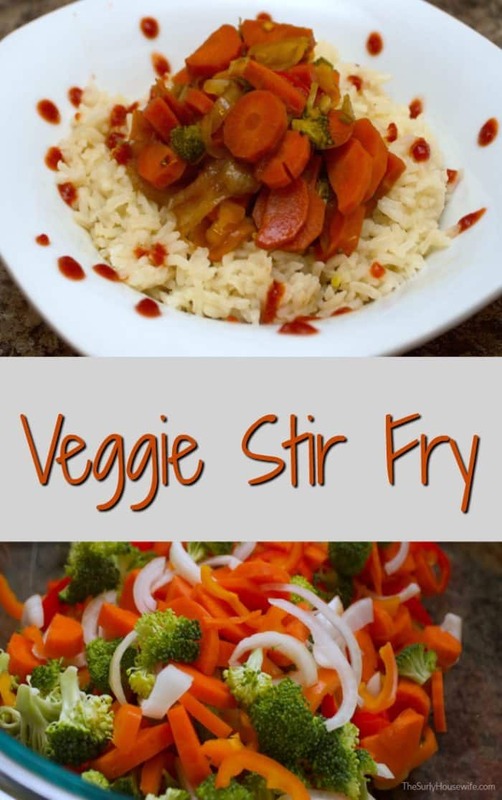 Veggie stir fry is one of my go-to recipes. It is quick, easy adapt, and best of all, my family loves it! !